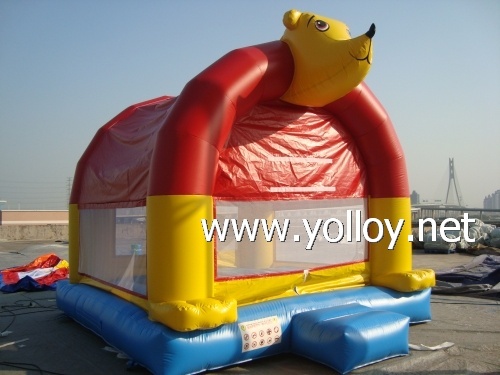 winnie the pooh inflatable bouncy house, It's suitable for 3~5 years old children. it's a very famouse carton character,so very popular for the children's birthday party or used it at the shipping mall, or kids amusement park. as it set up very easy, it can also be put at the backyard and an inflatable toy for your kids. we are manufactory in Guangzhou China, supplier a lot other popular inflable bouncy castle too, like the character of spideman, hello kitty, princess, disney ect. also the bouncy slide , inflatable obstacles and games that suitable for children's party. please feel free to contact us for more intresting item.